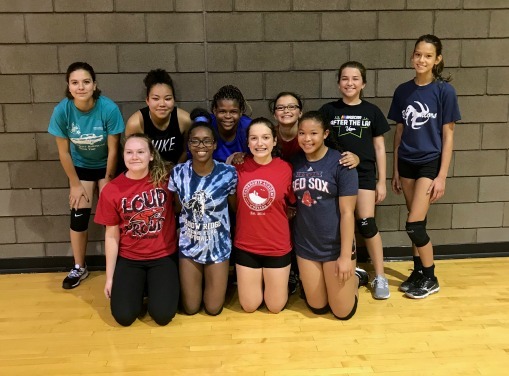 Discover some of the setting practice drills we do in Volleyball Voice Boot Camp classes and learn why we do them. The volleyball practice drills we do for setting in boot camp classes follow the same logic we use to do ALL six basic volleyball skills. We believe that players need to do ALOT of setting repetitions in a short amount of time in order to improve their technique. We've built out Boot Camp class reputation on our ability of having players touch 1000 - 2000 reps in one sixty minute or ninety minute session. We loosely follow the sequence of volleyball practice drills for setting taught in the USA Volleyball High Performance programs but then I add my own twist. I've added on drills and elements learned during my professional volleyball player experience while in Italy. I believe that ALL players regardless of the position they play in, need to be good at performing all six basic volleyball skills. I've seen it happen repeatedly... a "libero" who knew how to hit in the front row was needed to play in a tournament as an outside hitter because the regular outside hitter got hurt or sick. The "libero" who participated in spiking front row during volleyball practice drills was prepared to change her position and step into a different role which helped get the team out of a predicament. This is why I have all of our advanced players, regardless of their position, do the following volleyball practice drills for setting. All the players break into groups of two with partners and a ball. One player is on the ten foot line facing their partner on the end line. They begin overhand setting the ball until I call out the volleyball "set" they are to perform. The first call is usually - a "4" set back and forth. The "4" is the high ball set setters set to the left front player. Both players set the "4" back and forth until I make the next call. The "4" is a high ball 8 - 10 feet in the air that has a distinct peak at the height of its flight - like an "A" which should happen midway between the two players. This set, shaped like an "A", when done correctly should drop right on the head of the intended target/partner. Everyone on the team including middle blockers should all be able to set a "4". The intended target should NOT have to move in order to set the next ball. This is target practice and partners should be working hard to make the same set, the same height on each and every contact. Our Boot Camp class standards are high so we expect the ball to travel the same distance and peak at the same height for each set performed by both partners. Not only that, I don't make the next call until I see there's consistency in all the players performing the "4" set. Without stopping the ball partners are required to listen to the next call and perform the next set...without letting the ball stop or drop between them. Set a "2" to yourself and a "hut" to your partner. Each player sets a "two-ball" which is a ball set straight up and down 2 - 3 feet above the head of the setter...before setting a "hut". A "hut" is an outside, second tempo set that's lower than the "4", has some arc and no peak which at its highest point is 4-5 feet above the net. Set a "1" to yourself and a "Go" to your partner. These are first tempo sets, which means these are the fastest paced sets a hitter can hit. The "one" goes to the middle blocker while the "go" is set outside to the left side hitter. Volleyball Practice Drills The "Go" and the "One"
Setting The "Go" and the "One"
A fast set to zone 4 travels nearly 2 - 3 feet above the net with no arc or peak at a high speed then the "Hut" or the "Go". A quick set usually given to the middle blocker that's one foot above the top of the net, usually set in Zone 3. Set a "2" to yourself and a "side set a 4" to your partner. Players make a quarter turn to their right or left before setting the ball over their shoulder to the intended target. The "4" set is a high balll with a peak like an "A" which is set 8 - 10 feet in the air before dropping and landing on the targeted spot in Zone 4. Thank you for visiting this page. I'd love to know which volleyball practice drills are your personal favorites. Be sure to leave me a comment in the box below to let me know your thoughts. Remember to subscribe to our email mailing list! It's easy just scroll up to the box in the top left hand corner and leave your name and email address for updates on new articles, videos and exciting pictures and breaking news on Improve Your Volleyball.